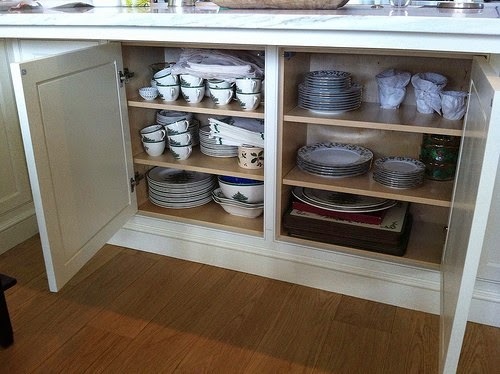 As I pulled out my Christmas china this morning, I was very thankful for my kitchen designer’s suggestion to incorporate storage into my kitchen island for holiday items. The process of switching out the everyday dishes with the Christmas china takes only a few minutes! My entire family loves the tradition of using Christmas china during the month of December, and I am looking forward to serving dinner on my beloved Spode Christmas Tree plates tonight (and throughout the month). I thought I would repost one of my favorite holiday blog posts from last year, showing the storage in our kitchen island for my Christmas china, and reflecting on the holiday tradition of Christmas china. Enjoy! This is what Spode’s Christmas Tree looks like – many of the items in the collection can be seen on Amazon here. This pattern was first sold in 1938, so it is the 76th anniversary this year. In my old house, I had very little storage space, so the Christmas china was packed away in dish storage containers that were placed on a high shelf. It was such a pain to bring the china out and pack it away that there were years when I used the Christmas china well into late January (I never considered skipping this Christmas season tradition, though)! On the top two right shelves, I have the new Christmas china pattern that I received for my birthday last year. It is Noritake Holly and Berry – holly is one of my favorite motifs of the season. This pattern is a bit dressier and I use it for holiday entertaining and special occasions, and on Christmas Eve. I'm working on my list of books for my Christmas list 2014. Do you have any to recommend? Coffee table books, design and architecture books, art books, or novels? Please leave a comment if you have a good suggestion! Click here to leave a comment on this post. Dear Holly, I think your families tradition of using the holiday china throughout the season is wonderful! Both the Spode and it Noritake patterns are beautiful! Thanks so much for sharing your storage solution! I have a Waterford pattern for my Christmas china..."Holiday Ribbons." It incorporates Mistletoe in the pattern, and coming from Oklahoma, where Mistletoe is the state flower, it's perfect for us! We live in California now, but it's a beautiful and festive reminder of our Oklahoma roots. i too have that spode dinnerware and I love it. To me it says tradition. I found a way to store it that both looks cute and is more sturdy for the cups and saucers. Put them together as you would be using them and stack. I love the way it looks.Happy Christmas. Holly, I definitely think it is a southern thing! My sister's sister-in-law started the tradition for her, and it has spread throughout the family. I have Mikasa's English Countryside. Very classic. Still love using it today as I did 15 years ago when I was first married. We get it out as soon as Thanksgiving is over. I swap out my everyday dishes, and my Christmas china is used all month long at every meal. Merry Christmas! We inherited my Mother in-law's Spode Christmas Tree China. She has at least 3 dozen place settings, including silverware, coffee cups and water & wine glass. With several serving pieces, pitchers, hurricane lamps, table cloths, napkins, placemats, etc. I could really throw a party if only someone would take care of making the food. I am so glad though to come across your blog today as I think it is a great idea to use your Christmas china for the whole month instead of just on Christmas Day. I'm taking them out of their quilted dish containers now! Hi, Holly. I pulled out my Spode Christmas Tree dishes on Monday. The minute the calendar says "December", I trade my everyday dishes for the Christmas Tree ones and use them all month long. My kids (now in their 20s) grew up with this tradition, although my husband and I didn't. With as much time and effort it takes to mobilize everything involved in decorating for Christmas, I am inclined to make the most of it, so all the decorations go up right after Thanksgiving. (I personally dislike Christmas decorations in homes prior to Thanksgiving because I think that cheats our fabulous autumn holiday out of having its own decorations!) I would be curious to know where most of the Christmas Tree china is sold in the United States--maybe it is more of a Southern thing. We live in Houston and it seems like everyone around here has it! Happy Holidays to you! Hi Holly, it's such a beautiful tradition in your family! I love china but I've never used it on Christmas time. Probably because my mum loves simple white. This year I made special plates with my design of holly berry. I'd like to use them every Christmas and make it as family tradition! Merry Christmas! I have a very good looking knock off of the Lenox Holiday (holly very wreath around the edge with gold trim) that I treated myself to for the millennium. I did use it here and there for Christmas but then it became such a bother ( I sound like my mother...)to drag it out for one week- so I started skipping years and you know how that goes- once you skip that becomes the new routine. Thank you so much for your warm post- I think you may have inspired me to dig them out and use them every day in my kitchen the month of December too! There's no reason not to- they are very nice looking knock offs and it I were to break one? well- at least I can say we enjoyed them, and sitting in my china cabinet serves no purpose. Thanks for the shot in the arm I needed!! I grew up with Christmas china -my parents still use it every December. It's a set of 12 with each plate being one of the days of Christmas. My brother and I would always fight over which ones we wanted (lords a leaping, golden rings, etc). I think it was a wedding gift to them as well and may be Spode but I'm not sure. We integrate storage like this often in our kitchen islands at work - one can never have enough kitchen storage and it's a great use of space. It also adds an additional 14" to the island which makes such a great work surface. Thank you for your helpful post. I will incorporate your design in my new kitchen island. Could you please share the source of your slipcovered barstools? They are marvelous as well. Many Thanks!